Hope is a crucial component of agency involving the setting of goals, visualization of obstacles, and increasing willpower in the effort of achieving a desired goal. This hope is not simply optimism and is potentially a bridge between structure and agency. Yet, the powers of hope in sociology have been greatly unexplored including the ability of collective hope to create social change. This lack of hope is particularly poignant in environmental sociology as the sub-discipline looks for solutions to some of the greatest challenges humanity and the planet faces. 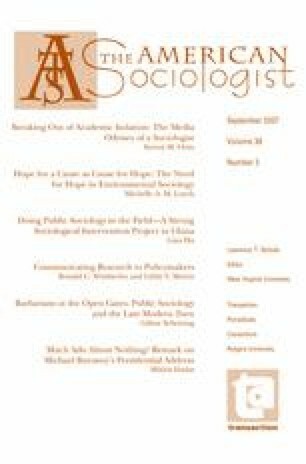 This article discusses the undercurrent of pessimism in environmental sociology and calls for the integration of hope as it is necessary for generating potential social environmental change.